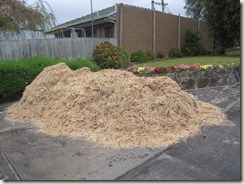 Had our 8 meters of mulch delivered on Friday. Kaye and I carted, tramped and spread the lot. Need to do this each 2 ~ 3 years. Dam good job by us. Thanks for the big effort Kaye. What this means is that the garden is virtually maintenance free. So – off on holidays. Here is pile that we started with.